Creative Sports Merchandise - Bobblehead Giveaways by Washington Nationals. 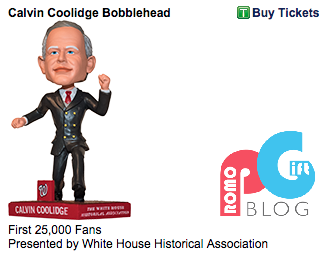 The American baseball team Washington Nationals is offering bobbleheads of the 30th president of the United States, Calvin Coolidge. These giveaways will be offered to the first 25,000 fans in attendance at the game between The Nationals and Balitimore Orioles 21 September 2015. This promotion is being offered in partnership with the White House Historical Association. Bobbleheads are perfect for promotional sports merchandise, and are great for increasing brand recognition. 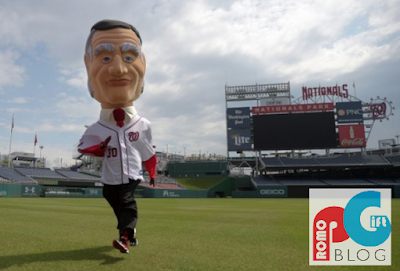 Calvin Coolidge is the Washington Nationals' mascot and is instantly recognizable among fans. Offering sports merchandise is an excellent promotional tool to include in your marketing strategy. It helps your company/sports team to stay in top of customers/fans minds. This is a great way to increase your brand awareness among your target group, as bobbleheads instantly attract attention, and customers are much more likely to show these items off. Giveaways like bobbleheads are a memorable product to use in your marketing approach. By offering these as free gifts, fans and customers will think positively about your company/team. Also giveaways like bobbleheads are great to offer as a collectable item. Bobbleheads can be manufactured in different shapes and sizes and as Washington Nationals show can fit any brand. This helps sports teams like Washington Nationals to increase brand awareness and thus an increase in sales.